Hemodialysis remains the most common mode of renal replacement therapy in patients with end-stage renal disease (ESRD). It requires an appropriate vascular access. The vascular access while being the “lifeline” for patients on hemodialysis is also the “Achilles' heel” of the therapy. Although the gold standard for vascular access remains an arteriovenous fistula, in clinical practice situations often arise which mandates the use of central venous catheter (CVC). These CVCs while providing an immediate access for the performance of hemodialysis may be associated with various complications. These complications are usually minor requiring conservative management, but at times may be potentially life-endangering. We report a case where during the placement of the dialysis catheter, it inadvertently perforated the left innominate vein. A potential disaster was prevented by deploying a covered stent over the site. This alternative percutaneous approach when available can be a safe alternative to open surgical intervention and represents a paradigm shift in our approach. Vascular access is the “Achilles' heel” of dialysis and is central to the performance of hemodialysis. Depending on the urgency of the situation, available expertise, and the state of blood vessel, many options exist. Native arteriovenous fistula (AVF) is universally accepted as the first choice as they are associated with lower incidence of complications such as infection, hospitalization, and mortality when compared with arteriovenous graft (AVG) and central venous catheter (CVC)., The National Kidney Foundation - Kidney Disease Outcome Quality Initiative (NFK-KDOQI) guideline recommends the use of CVC in prevalent hemodialysis patients to be less than 10%. Of all the patients starting hemodialysis in the United States, more than 80% initiate hemodialysis with a CVC. It is thus apparent that even in developed countries, there are roadblocks on the path to achieve the desired goal. Although the precise data for less developed economies are not available, the picture does not appear promising. The reasons for high usage of CVC are many and include limited nephrology services, ignorance, late referral, non-preservation of veins, limited expertise to create vascular access, and unsuitable vascular status due to high prevalence of type 2 diabetes mellitus. Resource constraints often mandate the use of anatomical landmark-guided techniques for placement of CVC. Landmark-guided cannulation is essentially a blind procedure and is associated with a wide range of complications. These complications can be reduced to a significant extent using real-time ultrasound and fluoroscopic guidance. Here we present a case of one of the major complications associated with central venous catheterization and an effective non-surgical endovascular approach to mitigate it, when available. A 61-year-old lady with longstanding type 2 diabetes mellitus and hypertension was on irregular follow-up at her native place. She had diabetes-related micro- and macro-vascular target organ damage resulting in non-proliferative retinopathy, nephropathy, neuropathy, and coronary artery disease. She progressed to end-stage renal disease (ESRD) and was started on hemodialysis through a right internal jugular vein (IJV) 11.5-Fr double-lumen pre-curved dialysis catheter. The subsequent course was complicated by numerous AVF failures and multiple episodes of catheter-related bloodstream infection. The lady was offered, but was unwilling to switch to continuous ambulatory peritoneal dialysis. She was admitted with left brachiocephalic AVF thrombosis, which could not be salvaged despite thrombectomy and angioplasty. Furthermore, there was a suspicion of right IJV thrombosis on Doppler ultrasound. She was prepared for left IJV dialysis catheter placement. The left IJV was cannulated under ultrasound guidance and the dialysis catheter placed using Seldinger's technique. The procedure was uneventful and no resistance was felt during dilatation or while advancing the dialysis catheter. 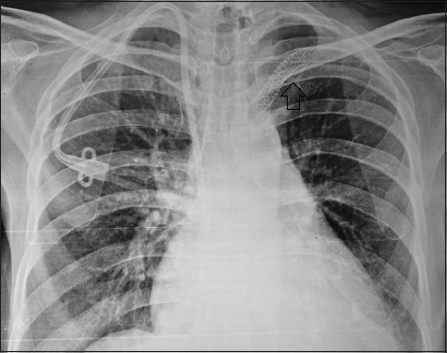 A post-procedure chest X-ray showed the catheter to have coursed normally, through left IJV, but at the junction of the left internal jugular and subclavian vein it had perforated the left innominate vein and the tip of the catheter was lying in the mediastenum [Figure 1]. The catheter was left in situ and the patient was immediately shifted to the intervention suite. Access to the right femoral vein was established and an 8-Fr long sheath placed. A 7-Fr guiding catheter was negotiated cranially over a 0.035-inch guidewire through the superior vena cava into the left brachiocephalic vein. A venogram showed tight stenosis in the left brachiocephalic vein distal to the perforation. The stenotic vascular segment was treated with angioplasty using an 8 mm × 4 mm balloon. A balloon-mounted stent graft (Advanta V12 covered stent, 9 mm × 59 mm; Atrium Medical Corporation, Hudson, USA) was negotiated and positioned in the left brachiocephalic vein adjacent to the site of perforation and kept ready. The left IJV dialysis catheter was pulled out and the stent graft simultaneously advanced to the site of perforation and deployed [Figure 2]. The post-procedure check angiogram showed a minimal contrast leak. The subsequent course was uneventful. The NKF-KDOQI Clinical Practice Guidelines on chronic kidney disease (CKD) estimate that CKD affects more than 50 million people worldwide and more than 1 million of these patients receive hemodialysis. The recommended vascular access of choice for hemodialysis continues to be AVF. These recommendations are based on the observation that AVF has a superior long-term survival and requires fewer interventions to maintain their long-term patency. Despite being the dialysis access of choice, many hurdles remain. Furthermore, a significant proportion of new AVF do not mature and even if they become usable, it takes time, often in excess of 4 weeks. The problem is further compounded by late referrals, lack of suitable expertise, and unsuitable vascular anatomy. There is thus a wide variability worldwide in the number of patients starting hemodialysis with native AVF; the highest incidence rates for AVF are reported from Japan and Germany. The “Fistula First” initiative was introduced in the United States in 2004 and it resulted in a significant rise in the prevalence rate of AVF. Despite all the initiatives and recommendations, CVC continues to be in vogue for a significant percentage of patients worldwide. Catheter-based hemodialysis poses a clinical dilemma – on one hand, it provides an access that is immediately available; on the other hand, it is associated with a variety of complications both immediate and delayed. The immediate complications include bleeding, hematoma, inadvertent arterial puncture, hemothorax, pneumothorax, air embolism, neurological injuries, arrhythmias, and vascular injuries including perforation. The delayed complications include infection, thrombosis, and stenosis. The use of ultrasound guidance to place CVC has become the standard of care worldwide. It helps in identification of vascular anatomy and ensures direct initial cannulation of the vessel, and thus reduces procedure-related complications. Furthermore, it has been shown to lower the risk of failed catheter placement, failure of catheter insertion on the first attempt, and associated complications. Although the use of ultrasound guidance ensures precise cannulation of the vein, the subsequent course of the guidewire, dilators, and the catheter into the central vein remains unguided and unseen. The ease of passage of the wire is often the primary mean of confirming proper location. If no resistance is met and the wire passes smoothly, it is assumed that the wire is in the venous system and at an appropriate level, that is, inferior venacava. To truly confirm the position of the guidewire, fluoroscopy must be used. In a recent study, Motta Elias et al. reported successful, non-fluoroscopic placement of tunneled catheter in 130 patients without any major complications. It will, however, be unwise to generalize these findings. Patients who have undergone multiple CVC placements often have central venous stenosis and distortion of normal vascular anatomy and it will be unwise to presume that the guidewire is appropriately placed based on clinical criteria alone. Fluoroscopy by providing visual clue and aid improves the safety of the procedure. It also ensures proper catheter tip position. KDOQI guidelines also recommend use of fluoroscopy for ideal catheter tip placement, although data to support this are anecdotal. In our case, the patient had multiple CVC insertions in the past and we used ultrasound-guided cannulation. IJV cannulation was uneventful and the subsequent passage of guidewire was smooth, without resistance. We therefore assumed that the guidewire is in place and went ahead with CVC placement and caused iatrogenic central vein perforation. 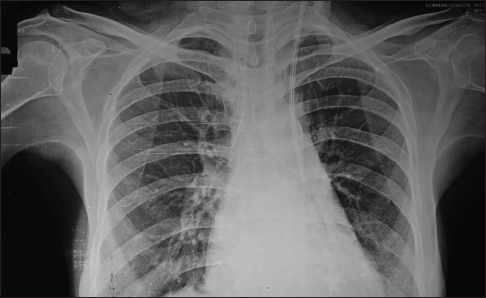 Had we used fluoroscopy, we could have possibly avoided the complication. The first step in the management of a case of iatrogenic CVC-related vessel injury or perforation is to leave the catheter in situ. Attempt to remove the catheter can lead to catastrophic internal bleed. The subsequent plan for intervention should depend on the available local resources and expertise. The available choices include either a conventional open surgical repair or an endovascular approach. In the setting of ESRD, the conventional surgical repair entails significant morbidity and mortality. Endovascular intervention is minimally invasive and allows the operator to plan and repair a wide variety of lesions as was done in the present case. It is imperative to use safe practices, adequate training, and right tools to avoid major complications during CVC placement. In cases of inadvertent iatrogenic central vein perforation, it is important that the catheter be removed only after arranging for a salvage procedure. Interventional nephrology using an endovascular approach represents an emerging therapeutic specialty in India to treat such complications with minimal morbidity and mortality. Dhingra RK, Young EW, Hulbert-Shearon TE, Leavey SF, Port FK. Type of vascular access and mortality in U.S. hemodialysis patients. Kidney Int 2001;60:1443-51. Besarab A. Resolved: Fistulas are preferred to grafts as initial vascular access for dialysis. Pro J Am Soc Nephrol 2008;19:1629-31. U.S. Renal Data System: USRDS 2011 Annual Data Report: Atlas of End Stage Renal Disease in the United States. Betesda, MD: National Institutes of Diabetes and Digestive and Kidney Diseases; 2011. Available from: http://www.usrds.org/2011/view/default.asp. [Last accessed 2017 Dec 02]. Dirks JH, de Zeeuw D, Agarwal SK, Atkins RC, Correa-Rotter R, D'Amico G, et al. Prevention of chronic kidney disease and vascular disease: Towards global health equity – The Bellagio 2004 Declaration. Kidney Int Suppl 2005;98:S1-6. Rayner HC, Besarab A, Brown WW, Disney A, Saito A, Pisoni RL. Vascular access results from the Dialysis Outcomes and Practice Patterns Study (DOPPS): Performance against Kidney Disease Outcomes Quality Initiative (K/DOQI) Clinical Practice Guidelines. Am J Kidney Dis 2004;44:22-6. Feller-Kopman D. Ultrasound guided internal jugular access: A proposed standardized approach and implications for training and practice. Chest 2007;132:302-7. Barsuk JH, Ahya SN, Cohen ER, McGaghie WC, Wayne DB. Mastery learning of temporary hemodialysis catheter insertion by nephrology fellows using simulation technology and deliberate practice. Am J Kid Dis 2009;54:70-6. Tong MK, Siu YP, Ng YY, Kwan TH, Au TC. Misplacement of a right internal jugular vein hemodialysis catheter into the mediastinum. Hong Kong Med J 2004;10:135-8. Kaupke CJ, Ahdout J, Vaziri ND, Deutsch LS. Perforation of the superior vena cava by a subclavian hemodialysis catheter: Early detection by an angiography. Int J Artif Organs 1992;15:666-8. Hoggard J, Saad T, Schon D, Vesely TM, Royer T. Guidelines for venous access in patients with chronic kidney disease: A Position Statement from the American Society of Diagnostic and Interventional Nephrology Clinical Practice Committee and the Association for Vascular Access. Semin Dial 2008;21:186-91. Rabindranath KS, Kumar E, Shail R, Vaux E. Use of real-time ultrasound guidance for the placement of hemodialysis catheters: A systematic review and meta-analysis of randomized controlled trials. Am J Kidney Dis 2011;58:964-70. The National Institute for Clinical Excellence (UK). Central venous catheters – Ultrasound-locating devices: Guidance. Available from: http://www.nice.org.uk/nicemedia/live/11474/32461/32461.pdf. [Last accessed 2017 Dec 02]. Motta Elias R, da Silva Makida SC, Abensur H, Martins Castro MC, Affonso Moysés RM, Pereira BJ, et al. Insertion of tunneled hemodialysis catheters without fluoroscopy. J Vasc Access 2010;11:138-42.